In recent years, almost every boxing pay-per view-event in the United States has had a 6 p.m. Pacific start time. But Showtime is going outside the norm for its Sept. 13 PPV telecast of the Floyd Mayweather Jr.-Marcos Maidana welterweight title rematch. Instead of the 6 p.m. start, the telecast will begin at 5, with Mayweather and Maidana expected in the ring shortly after 8. Stephen Espinoza, executive vice president and general manager for Showtime Sports, said the hope is to get more East Coast and Midwest buys with the earlier start time. Espinoza said the earlier start time in the West shouldn’t negatively impact PPV sales in the Pacific time zone. “You’ve got college football at 5, and the fight’s at 8. It’s a perfect lead-in for people who want to watch both,” he said. 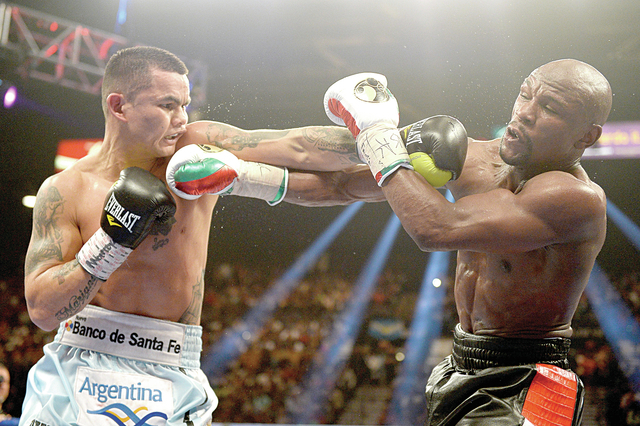 The first Mayweather-Maidana fight didn’t break 1 million in buys. Perhaps the hour’s difference and the fact the rematch is being promoted far more heavily than the first meeting on May 3 will boost sales. The fight will cost $64.95 for standard definition and $74.95 for high definition. ■ LEONARD-DURAN REUNION — First, Mike Tyson announced he would present rival Evander Holyfield at the Nevada Boxing Hall of Fame dinner and induction ceremonies. Now, the Hall has announced that Sugar Ray Leonard will attend Saturday’s ceremonies at the Tropicana to present his rival, Roberto Duran. The Hall, in its second year, will enshrine 18 new members. The class of 2014 is comprised of former champions Holyfield, Duran, George Foreman, Cornelius Boza-Edwards, Joe Louis, Sonny Liston, Jack Dempsey and Archie Moore; referees Richard Steele and Kenny Bayless; trainer Miguel Diaz; matchmaker Bruce Trampler; writer Kevin Iole, a former Review-Journal reporter; broadcaster Colonel Bob Sheridan; former Nevada Athletic Commission members Chuck Minker and Luther Mack; and hotel executives Steve Wynn and Clifford Perlman. Actress and boxing fan Rosie Perez will be the co-host for the ceremonies, along with veteran boxing announcer Barry Tompkins. Tickets remain available at nvbhof.com. ■ BKB CARD UPDATE — Three undercard bouts have been added to the Big Knockout Boxing card Aug. 16 at Mandalay Bay. Anthony Johnson and Dimar Ortuz will meet for the cruiserweight title, David Estrada and Eddie Caminero will fight for the junior middleweight crown, and Javier Garcia and Darnell Jiles will vie for the welterweight championship. Gabe Rosado and Bryan Vera will meet for the middleweight title in the main event. The inaugural BKB card in Nevada will be available on pay-per-view for $29.95.